As a college student in 1990, I bartended at Peko's Bar in the Sunset District around 19th Avenue in San Francisco. One cold night, a customer brought me the famous roasted crab from the storied Vietnamese restaurant Thanh Long. It was the best crab I had ever tasted. I went back to the restaurant with friends a few times but only got in twice after waiting for more than an hour. The price was $17 a crab — or four hours salary as a bartender. But we college kids shared and ordered a few dishes of garlic noodles to go with it. Almost 30 years later, I heard it goes for about $60 per crab now. While I was still living in the city, I met a Chinese immigrant from Vietnam. She showed me how to make that roasted Dungeness crab and my palate for crab was never the same. I remember we spent a day in her tiny kitchen with a lot of screaming and laughing, trying to kill and clean the crabs. She also introduced me to this amazing French butter and the Chinese sugar syrup for the crab. I think hers was better than the restaurant's. When I moved back to Eureka in the early '90s, there were plenty of fresh crabs and the season was longer. Every year I make this dish for gatherings. Watching my family and friends enjoyed them is the biggest reward. Now, with the shorter seasons, we try to enjoy it while we can. My friend and I named our version of this dish French butter Dungeness crab, but I have never written it down until now. For this recipe, I used brown sugar to make the syrup instead of the harder to find Chinese syrup. Beurdell French butter is available in Sunset Supermarket in San Francisco or via Amazon. You can substitute with other European butters but it may not be as rich or buttery. When the season ends and crab is not available, prawns, lobster or scallops can be used intead and served over a bed of pasta. 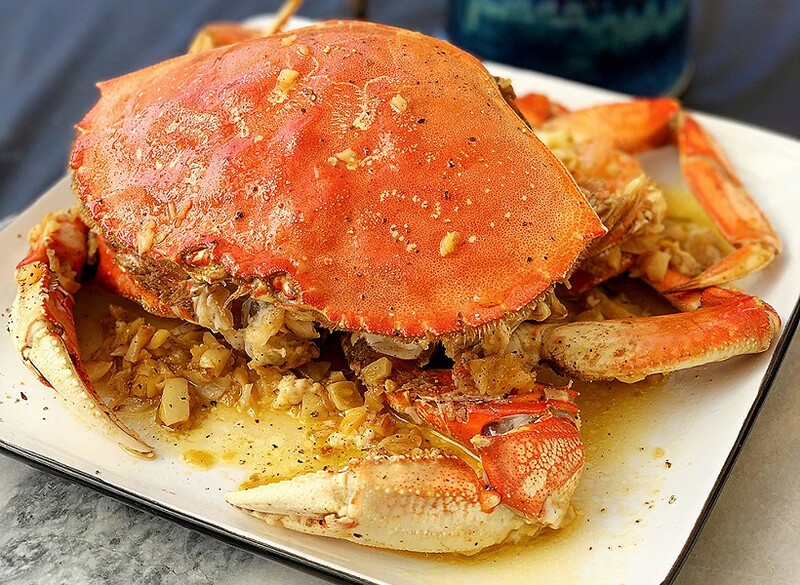 Kill the crab by swiftly and firmly by striking the point of the small V-shaped plate on its belly with a knife. It should immediately go limp. Next, clean the crab, removing the lungs and separating the legs and body from the back shell, reserving the innards or "crab butter" in the shell. Pull apart the legs and chop the body sections into four pieces. Drain any excess water. Microwave the brown sugar and 1/3 cup of water for 1 minute, stirring to make a loose syrup, and set aside. In a large cooking pan or wok, melt both butters over medium heat. Add the garlic and sauté until just golden. Next add the chopped crab pieces except for the back and stir fry them in the garlic and butter for 2 minutes, turning frequently so they're evenly coated. Pour the sugar syrup into the pan, add the salt and pepper, and continue stir frying, tossing the crab pieces well. Place the back of the crab on the top of the other pices and cover the pan with a lid. Let the crab cook for another 10 minutes over high heat. There should be some liquid remaining in the pan. 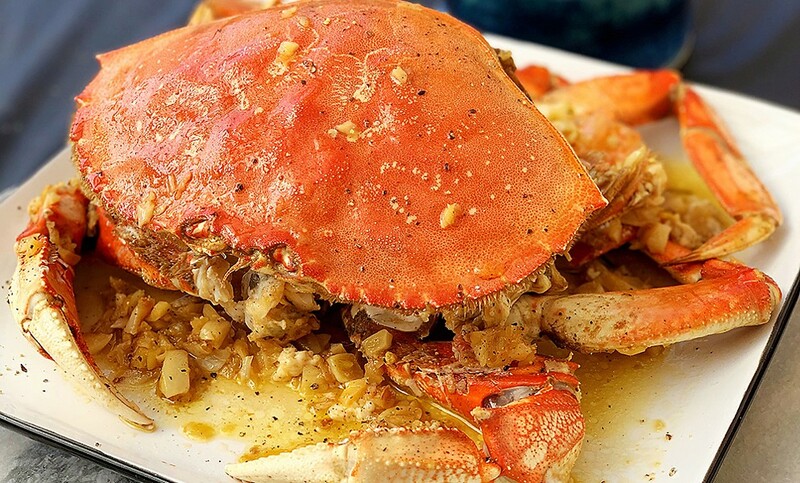 Arrange the crab pieces on a plate like a whole crab, with the claws out front and the shell on top. Drizzle the remaining pan liquid over the crab. Sprinkle more fresh pepper if desired. Serve with French bread to mop up the garlic butter. You can find Home Cooking with Wendy Chan classes benefitting local charities on Facebook.